Distribution: This subspecies of the western rattlesnake is found in California, from Santa Barbara north through most of Oregon and eastern Washington. Habitat: This rattlesnake occurs in arid plains, desert margins, fertile valleys, prairie grasslands, chaparral-covered foothills, on rocky ridges, in mountain meadows, and forests. Diet: Juveniles prefer lizards, adults eat primarily rodents, some lizards, amphibians and rarely birds. Behavior: This species of rattlesnake is a generally passive, non-aggressive species. They generally come out at dawn and dusk or are nocturnal during the hot summer. They will sometimes come out during the day to bask on rocks, but normally stay hidden in crevices most of the day. Life Span: 10-15 in the wild, 15-20 years in human care. Our young rattlesnake was found in an office building in Redding. There are many color variations which has them often mis-identified as Timber rattlesnakes. This is the only venomous snake found in Northern California. You cannot tell the age of a rattlesnake by counting the segments of the rattle. They shed different amounts throughout their lives; sometimes up to six times a year. Being made of keratin, they will break off when they get too long. The northern pacific rattlesnake is part of a group of venomous snakes called pit vipers, named for the deep pits in front of its eyes that act as heat-sensing organs for locating warm-blooded prey. Between 7000 and 8000 people in the US are bitten by venomous snakes each year, with only 6 deaths on average. 40-60% of bites in the US are dry bites. This means that the snake did not inject any venom. A female rattlesnake can store a male’s sperm for years until an optimum time for fertilization. Rattlesnakes will not always rattle before they strike. 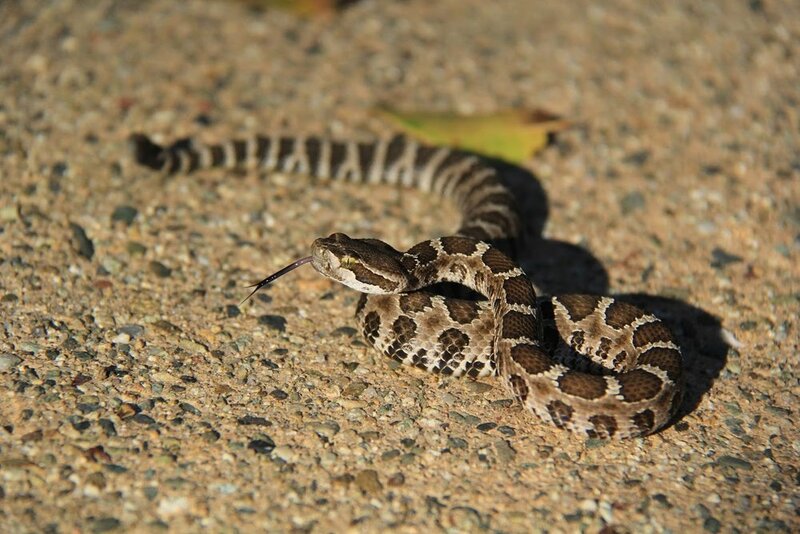 When a rattlesnake is fearful of its life, they will rattle as a warning to stay away. The primary use of venom is to kill and begin digestion of prey; they will only use it as defense if absolutely necessary. Baby rattlesnakes are NOT more dangerous! They have a much smaller amount of venom than an adult and can control the amount injected.